The lovely folks at Broomhills Farm River Eco Pods in Cumbria are offering a free stay to an Ellie's Friends member & guest. 2 nights Sunday - Friday (exl school holidays) Sleeps 2 Dogs welcome A unique opportunity to stay in idyllic woodland surroundings along the stunning river Lyne with its nature on your doorstep! 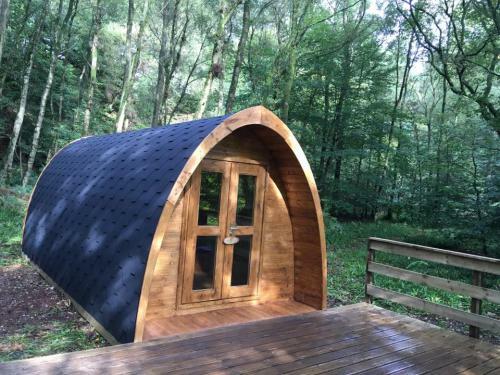 Relax, unwind and be at one with nature at Broomhills Farm River Eco Pods, set in the heart of ancient woodland on the River Lyne in Cumbria. You will be amazed by the rugged, unspoiled beauty of the woodland area with exceptional views and complete peace.A perfect base for bird watching, cyclists, walkers, anglers, animal lovers and families who enjoy great outdoors. As our guests you will be given the privileged opportunity to stay within The Lyne Woods, which has been a special site of scientific interest since 1965 (SSSI a protected area by Natural England.) So join us at Broomhills Farm Eco Pods; step outside, get some fresh air, away from it all, throw yourself into the outside world and learn to love and appreciate the little things. Enjoy exploring the beautiful woodland and its wildlife species, sit and relax by the river, then in the evening enjoy a wonderful night under the stars. Our Pods offer warm, dry, cosy and comfortable accommodation whatever the weather. Camping without the tent! Practical whatever the weather. Enjoy long summer days and at night switch to Solar Power! We are located in Cumbria, (ONLY 10 minutes’ drive from M6 motorway jct 44) perfectly situated to enjoy the historical sites of Hadrian’s Wall, The Great Border city of Carlisle or go over the Scottish Border to the town of Gretna. The Lake District is within easy reach to explore England’s highest mountain, deepest lake or the beautiful Cumbrian coastline.